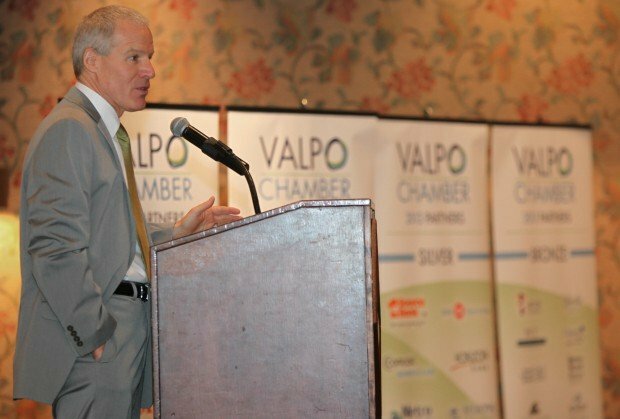 Valparaiso University President Mark Heckler makes brief comments before an interactive presentation at a chamber of commerce luncheon Thursday at the Strongbow Inn. 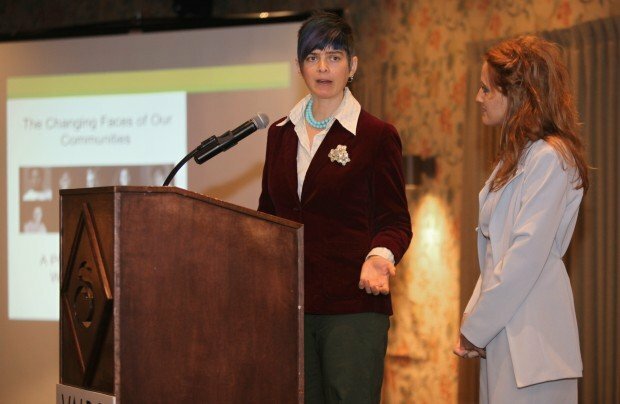 Allison Schuette, left, and Heather Taylor from Valparaiso University's Welcome Project present an interactive presentation at a chamber of commerce luncheon Thursday at the Strongbow Inn. Lee Baker, Kirk Alexander and George Douglas discuss an audio clip they had just listened to during an interactive presentation at a chamber luncheon Thursday at the Strongbow Inn. Charley Gillispie looks on as Mark Zimmerman discusses a video clip they had just watched during an interactive presentation at a chamber luncheon Thursday at the Strongbow Inn. VALPARAISO | Valparaiso University officials are asking local businesses and residents to consider how they can help make a rapidly diversifying community more inclusive. Like many parts of the United States, the city of Valparaiso and the university have seen a shift in demographics in recent years, with increases in racial and ethnic diversity. To address the changes, they each have launched initiatives, one of which was presented Thursday at the Greater Valparaiso Chamber of Commerce's Percolator Club monthly luncheon at Strongbow Inn. The Changing Faces of Our Communities: a Presentation of the VU Welcome Project is designed to spur discussion about issues of diversity on and off campus. Allison Schuette, associate professor of English at VU and Welcome Project co-director, and Heather Taylor, executive director of marketing communications at VU, played video and audio clips of VU minority students and alumni who described how they had been treated on campus and in the community. In one clip, a Chinese student said she and other Chinese students were verbally assaulted by people driving by in a car in downtown Valparaiso. The people shouted, “Go home, Chinese dogs,” the student said. The incident destroyed the Chinese students' enthusiasm for the United States, she said. In another clip, a black alumnus described how he and other black students rented a car to go to Gary to get their hair cut because he said no one in Valparaiso knew how to cut black hair properly. Three weeks later, the black students were called into the VU Police Department and questioned about their possible involvement in a string of burglaries in Valparaiso, he said. The alumnus said police suspected the black students of transporting stolen property to Gary because they had rented a car and driven there. Not all the clips depicted negative incidents. A VU student from Kazakhstan said he had been stranded after missing his stop on the South Shore Line, but he received a ride back to the university from compassionate passers-by. After each clip, Schuette and Taylor asked members of the Valparaiso Chamber of Commerce and others to discuss how those stories impacted them and how they as business leaders could respond. The presentation also included statistics on the growth of minorities in the city and at the university. Between 2000 and 2010, the number of blacks in Valparaiso grew from 0.9 to 3 percent and the number of Hispanics, from 4.8 to 8.5 percent. Of Valparaiso's total growth, 56 percent has been from minorities, Mayor Jon Costas said. VU President Mark Heckler said the university's strategic plan calls for the student body to grow from 4,000 to 6,000, and a large part of the growth will be from domestic minorities and international students. The goal is to increase the international student population from 168 to 1,000, he said. “That has huge ramifications for this community,” Heckler said. For more on the VU Welcome Project, visit http://welcomeproject.valpo.edu.